Fire Spotter is another Field Notes COLORS edition I did not get until much later. I ended my first subscription with Dry Transfer, and had decided to rely on local stores, so that I could pick and choose which editions to buy. In hindsight, that was a bad move because I learned that local stores don't consistently stock limited editions. One store even closed for good. This is the period in which I “missed out”, either because I couldn't find them locally, or forgot to buy them online. Rookie mistake. So. Fire Spotter. The red on this thing is absolutely gorgeous. I'm sure many Field Notes fans exclaimed, “Finally, red!” when it was released. (I don't think the red in County Fair counts. It's more red-orange than true red.) The impact of Fire Spotter was somewhat lost on me, unfortunately: by the time I got my hands on it, I'd already seen Red Blooded which is very, very similar (more on that here). The inspiration behind this edition is quite interesting, though, and I like Field Notes as a brand for that. I knew diddly squat about fire spotters, so it was fun to learn as I searched what all the “Practical Applications” referred to. Did you hear about that Field Notes fan who, inspired by this edition, decided to volunteer as a fire spotter? Talk about inspiration! Fire Spotter is the first COLORS edition to feature dot grid pattern inside, instead of the graph grid found in the previous editions. Mr. Bryan Bedell of Field Notes said that the dot grid was “done on a whim” but that certainly didn't deter people from buying 1,500 3-packs online in less than 48 hours. Wow. To be honest, I wasn't a fan at first but I might prefer the dot grid over the regular graph grid now. Another unique thing about Fire Spotter is that a temporary tattoo from Tattly was included in the 3-pack. The design of the tattoo is slightly different from the design on the back cover of the books but they both say, “Always Watching”. I don't have this tattoo. Boo hoo. I should note, when this edition was released, Field Notes lowered the COLORS subscription price, from $129 to $97. I'm sure that prompted a lot of people to finally pull the trigger. 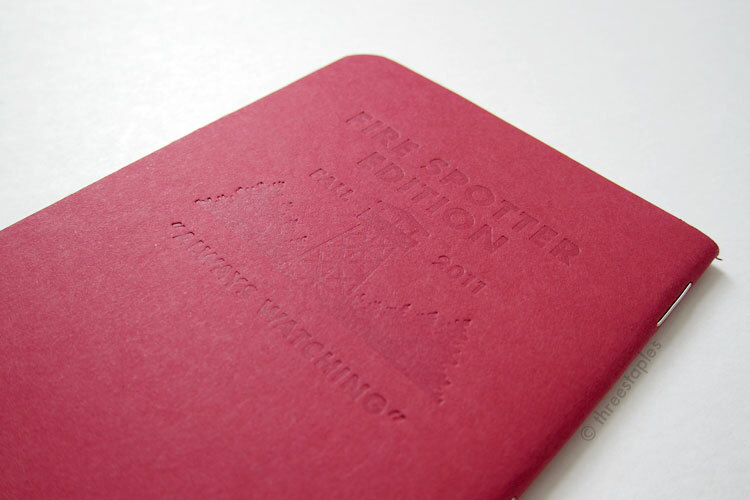 Fire Spotter (Fall 2011) is the 12th edition in the COLORS series. Outside cover: French Construction 100#C “Electric Red” with text spot-varnished debossed by Flywheel Letterpress, same folks who did Raven’s Wing and Grass Stain Green. Film: Field Notes Fire Tower (apparently, this film inspired the edition, instead of the other way around. More on the film and the featured tower here). Do you have the tattoo? Did you use it?